This leasehold apartment in the Viaduct precinct sold for $135,500. The major apartment auctions in Auckland continue to produce mixed results, but overall the market seems more subdued than it was a couple of months ago, with fewer apartments being put to auction and buyers being generally more cautious. At City Sales' auction this week three apartments were on offer, two being typical investors fare and another that would probably have appealed more to owner occupiers, and although all three attracted bids from prospective buyers, none was sold under the hammer and they were all passed in for sale by negotiation. At Barfoot & Thompson's mixed commercial property and apartment auction this week, four apartments were offered and three sold under the hammer (all typical investor fare) at prices that ranged from $285,000 for a two bedroom unit on Hobson St to $471,000 for a three bedroom unit in the Kiwi on Queen building at the top end of Queen St. 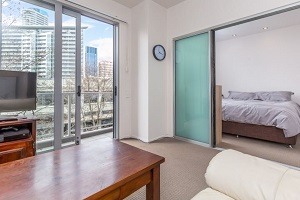 But there were no bids for a 140 square metre unit with three bedrooms and a car park in the Hobson Gardens building, also on Hobson St.
At Ray White City Apartments auction just two units were offered. The first, a leasehold, one bedroom unit (35 square metres) in the Vibe building down in the Viaduct precinct which went for $135,500. According to QV.co.nz the unit had been purchased in 2004 for $225,000 but likely buyers for this unit probably took into account that the ground rent for the property (currently $4049 a year) is reviewed every seven years and will next be reviewed at the end of 2018. A two bedroom apartment in The Quadrant building near the Auckland High Court attracted some competitive bids, but they weren't high enough to get passed the reserve and it was passed in for sale by negotiation, giving the auction a 50% clearance rate. The results of all three auctions including the prices achieved and details of the properties that didn't sell under the hammer, are available on our Auction/Sales Results page. Not sure the Hulk Hogan tash does it for me.